The world clings to Christmas with a kind of desperation: it is the only traditional festival, apart from a flurry of new hats at Easter, that retains any real hold on ordinary life. The reason for its persistent vitality is not easy to see. It is not primarily the influence of Christianity, for in the Christian Church Christmas is only one event in a long calendar. The unique popular Christmas outside the Church is hardly a Christian festival at all. Its presiding deity, so far as it has any, is the carnival figure of Santa Claus. The cynical answer is that commercial advertising keeps Christmas going, but that is nonsense. The public is quite capable of resisting pressure of this sort if it has no answering response to its appeal. No: people want Christmas, though they hardly know why they go through all that bother every year. Perhaps the answer is that people go through the bother of Christmas because Christmas helps them to understand why they go through the bother of living out their lives the rest of the year. For one brief instant, we see human society as it should and could be, a world in which business has become the exchanging of presents and in which nothing is important except the happiness and well-being of the ultimate consumer. It is only a symbol, and humanity can hardly stand more than about twelve hours of really civilized behaviour, but still it is there, and our Christmas shopping may be inspired by an obscure feeling that man is done for if he loses entirely the vision of life that Christmas represents. Potentially, therefore, there is a tremendous revolutionary power in the idea of Christmas. 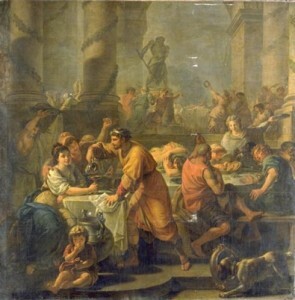 When Christ was born there was already a Christmas in Rome, a late December festival called the Saturnalia held in memory of a Golden Age when men were free and equal. The distinctive feature of that festival was the licence given to slaves, who were allowed to answer their masters back, sit down at table with them, and even be waited on by them. It was a dumb, helpless ritual which said symbolically that the structure of Roman society was all wrong. It did not save the Roman Empire, any more than a futile pretence of making things easier for the underprivileged at Christmas will save us. A helpless Christmas is an intolerable hypocrisy, especially when associated with Christianity. It is unlikely that the evangelists who told the Nativity stories would have thought that a cosy, cuddly, sentimental good time was an appropriate way of celebrating Christ’s birth. Christianity speaks of making the earth resemble the kingdom of heaven, and teaches that the kingdom of heaven is within man. This is something very like the conquest of the whole year by the spirit of Christmas, and is the kind of thing we mean when we wish a merry Christmas to all our readers. This entry was posted in Uncategorized on December 23, 2012 by Joseph Adamson.